Research Campgrounds For Sale - RV parks for sale all over the United States. 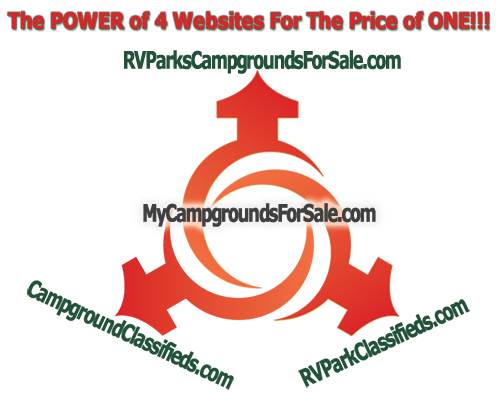 To begin a campground search simply select the "Campgrounds For Sale" button at the top right on any page. If you own or manage a campground that is for sale, you may list your campgrounds for sale or RV parks for sale on our website! For more details about our campground listings select the "Start A Listing". "Where can I successfully sell my campground?" "How do I successfully list my RV park for sale online?" "Does selling my campground on a by owner website have to be difficult or expensive?" "What volume of targeted visitors will actually see my campground for sale?" Click here to list RV parks or campgrounds for sale. We provide an online venue dedicated to bringing the campground buyer and seller together. Our website is easy to use yet gives the buyer comprehensive information about each of the campgrounds or RV parks for sale. How To Use This Site If you are selling a campground or RV park and would like to advertise on our site, just choose List My Campground at the left of any page. Follow our step by step instructions to get your park listed today! If you are a buyer searching for RV parks for sale, begin your search by selecting the Campgrounds for Sale by State or All RV Parks For Sale buttons at the top left under our HOME button on any page. We strive to make your campground search as easy as possible. Why Use Our Website To Research RV Parks for Sale? Our marketing company, A.W.S.M. has been a leader in Internet website marketing since 1997. We have developed technology to get our website's listed at the top ALL the major search engines. This equates to qualified traffic to our website from the very beginning and continues to grow week after week. A similar website developed by our firm, MobileHomeForSaleByOwner.com, is on track to have over 14 million hits this year!! This month's website traffic is up 400% over just 6 months ago!!! With this current trend we are on track to have nearly 2.25 million hits over the next 12 months.